Metallics and bold colours are big this summer, so I combined the two. I chose an unusual swarovski colour named Carribean Opal which has a ghostly sheer look to it, in the light it glistens with hints of greens and yellows.I combined this with 8mm sterling silver textured beads. 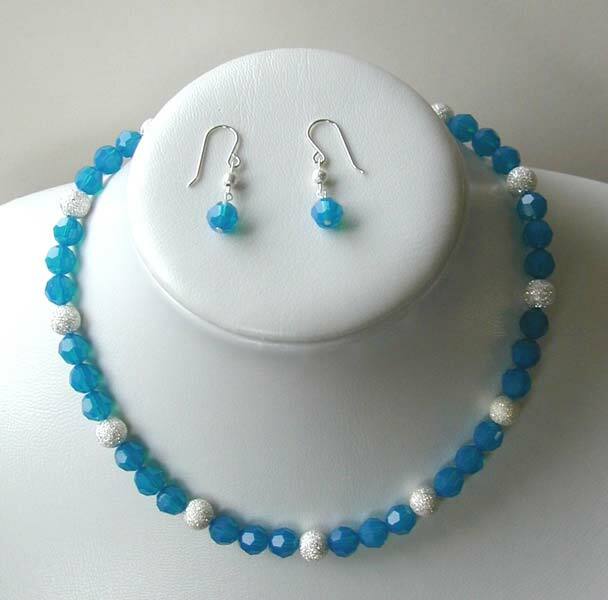 This piece is 15" long with a sterling silver clasp.Its extraordinary colour would look angelic on a summers day.Either to wear with the necklace on on their own, this necklace comes with a pair of sterling silver drop earrings with swarovski and textured silver beads.